Spyrida with a frontal belt. 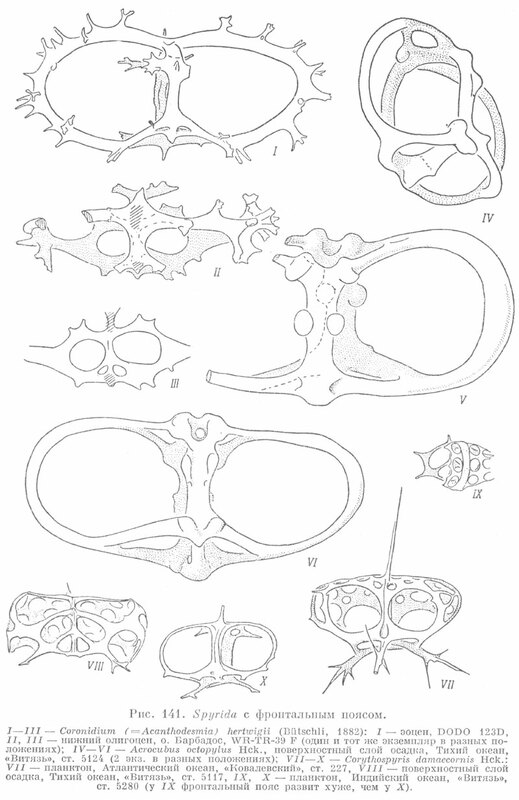 I) Eocene, DODO 123; II, III) Lower Oligocene, Barbados, WR-TR-39-F (one and the same specimen in various positions); IV-VI) Acrocubus octopylus Hck., surface layer of the sediment, Pacific Ocean, “Vityaz”, station 5124 (2 specimens in various positions); VII-X) Corythospyris damaecornis Hck. : VII) plankton, Atlantic Ocean, “Kovalevskij” station 227; VIII) surface layer of the sediment, Pacific Ocean, “Vityaz”, station 5280 (in IX, the frontal belt is more poorly developed than in X).